Tiffiny Saywell completed our block release dog grooming courses in 2012/2013. We caught up with Tiffiny and asked her to share some of her experiences about her time on the courses, and what her plans are for the future. The programme that I undertook was the dog grooming course. I chose the particular course as it was something that I have always wanted to do and I have always loved animals, especially dogs! The fact that the course was a 10 week intensive course also appealed to me as I found this the most convenient. The part that I particularly enjoyed the most was the practical side of the course, where it was more hands on; this built up my confidence working with the animals, and also meeting the dogs’ owners who would advise if the dog had any specific requirements. This personal touch also aided my personal client relationship skills that I have now adapted into my own business. 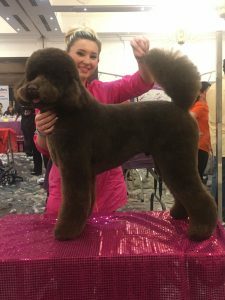 The part I found most challenging was getting a difficult dog booked in, and learning to adapt each scenario to make it a stress free experience for that dog. The reason that I chose to train at The College of Animal Welfare was, firstly, due to the locality and the convenience for me to get to. The fact that they also offered the 10 week intensive course appealed to me as this was what I wanted to do. The thing that I appreciated the most was making a new close knit group of friends, of whom I am still in touch with today. We are regularly In communication and are always on hand to help one another out regarding work/what we learnt at college. With respect of any future plans, I would like to expand my business, Brite Barks, further and I am currently doing my ICMG, of which I am planning to complete by the end of this summer, which means that I will be an international certified master groomer. 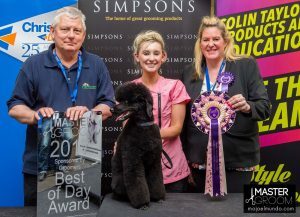 I also regularly compete at dog grooming competitions all over the UK where I have placed and won multiple times. This is something I continue to look to do and my long term goal is to be part of Groom Team England. Regarding any advice for anyone looking to do the course, I would strongly urge anyone to do it; not only is it a great experience but also the network that it has created for me personally, and also the career avenues that it has opened for me. Not only do you get the qualification but new relationships will come of it that will most definitely help you out in the future.